Current: Think quitting is expensive? Think again. Top tips to stop smoking and start saving. Have you thought about quitting, but are worried about the cost of things like patches? 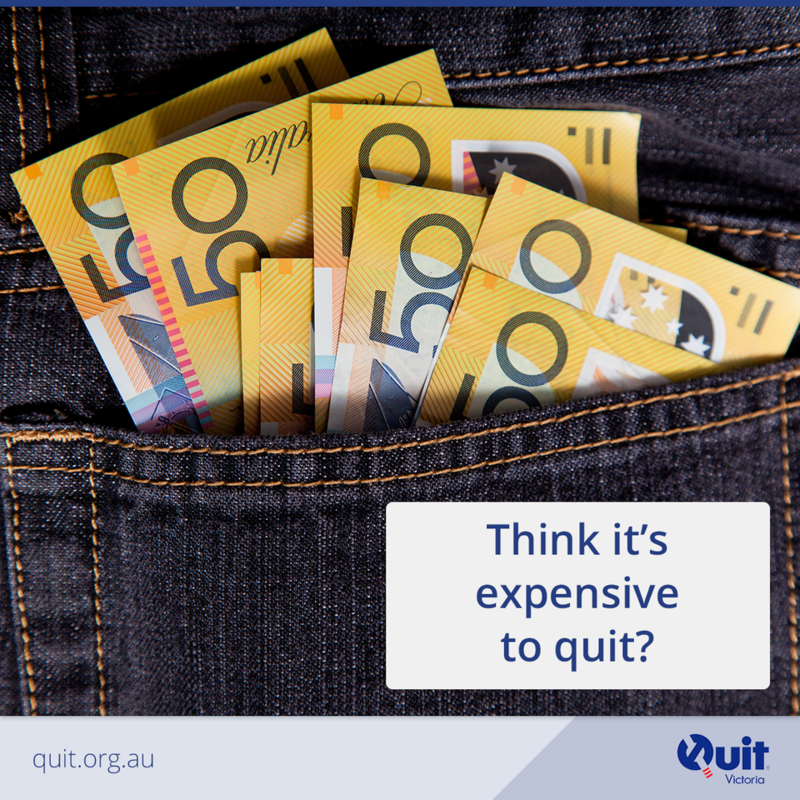 You’re not alone; lots of smokers say that they can’t quit because it’s too expensive. Although it feels like nicotine replacement products are pretty expensive, when you compare it to the long-term costs of smoking, the price of the products starts to look much better. Don’t let cigarettes own your finances – take back control and spend your money on the things that make you happy. Got your eye on a new TV? Always wanted a family holiday to Bali? Fancy replacing your car? All of these things could be yours! Crunch those numbers Quit Victoria’s online cost calculator can help you work out how much you spend on cigarettes on a daily, monthly and yearly basis. If you smoke a pack a day at $30 a packet that’s $210 per week, $913 per month and $10,950 per year of your hard-earned cash that you could instead spend on the things you want. Speak to your doctor Not only can your doctor advise on the best quitting approach, they can also lower the costs of quitting products with a prescription. Nicotine patches, gum and lozenge, and Champix and Zyban, are available at reduced rates under the Pharmaceutical Benefits Scheme (PBS). Call the Quitline 13 78 48 Calling the Quitline greatly increases your chances of quitting successfully. Our friendly and qualified Quit specialists are like personal trainers for quitting, they can help you build a plan and overcome any obstacles along the way. You can request a call-back totally free of charge. Jayson used to smoke 50 cigarettes a day, sometimes waking up in the middle of the night to have a cigarette. But when he suffered a stroke, aged just 35, he decided to make some changes for the sake of his health and his family. He has been quit for nearly 15 years, saving over $16K a year – that’s around $240,000 all up!